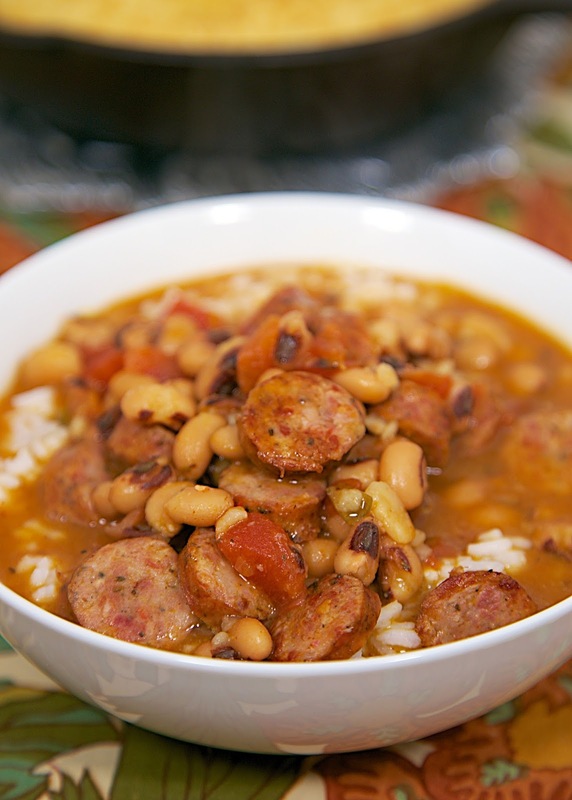 Black Eyed Pea and Smoked Sausage Soup - smoked sausage, black eyed peas, onion, garlic, RoTel, cajun seasoning, chicken broth and rice - Ready in 20 minutes! LOVE this soup. 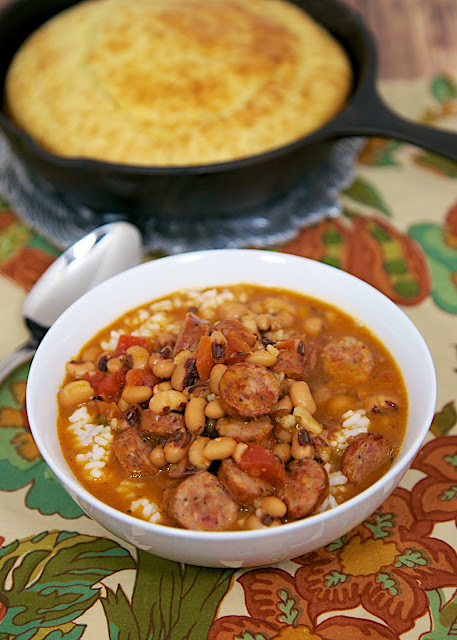 Serve with cornbread for an easy weeknight meal!! It is a Southern tradition to eat black eyed peas on New Years. Eating black eyed peas is supposed to bring you good luck in the new year. I need all the luck I can get, so I always eat black eyed peas. This year we are having this Black Eyed Pea and Smoked Sausage Soup. It is SO good!!! We served this soup over some rice, and it was delicious and filling. It had a little kick from the Rotel. Just make sure to buy mild Rotel if you are sensitive to heat. You can also make a few simple swaps to this recipe to make it a little healthier - try turkey smoked sausage and brown rice. Both swaps taste delicious! In a Dutch oven over medium-high heat, cook smoked sausage until lightly browned. Add black eyed peas, onion flakes, garlic powder, Rotel, cajun seasoning and broth. Bring to a boil and reduce heat. Simmer for 20 minutes. Serve with cooked rice. This looks delicious, Stephanie! Love that it has black-eyed peas and rice. Very hearty! Swanson's Louisiana Cajun Broth is not sold in this area. What could I substitute? This recipes looks delicious and easy. I live in south Louisiana and buy Swanson's broth, but I've never heard seen or heard of their Louisiana Cajun version. I wonder if I could just add some Tony Chachere's seasoning to make it Cajun. Fantastic! I used what I had- free-range organic chicken broth, mild RoTel, and Aidell's chicken and apple sausage. It was delicious, and it was a huge hit with my family and guests today for New Year's. We will definitely make this again. Thanks so much for sharing! What about cooking this in a slow cooker... Any suggestions on cook time? It would only need a couple of hours to heat through. Maybe 2 hours on LOW. Should I pre-cook the sausage before I drop it into the slow cooker? I always like to cook the sausage so it gets a little color on it, but you could just drop it in the slow cooker and it will be fine. I made this last night and it was DELICIOUS! Fast to make and one pot for everything...that's my kind of cookin. Thanks for the inspiration, Stephanie! Made this for New Years Day yesterday. Unfortunately it also meant discovering that we don't like "Cajun style" seasoning. Oops! Takeaway: Make a small batch if you aren't sure your family enjoys hot & spicy Cajun flavors.